Nose­­­­­-to-tail eating isn’t exactly a new concept but in the late 1990s in Britain, it was once again made popular by chef Fergus Henderson, author of The Whole Beast: Nose to Tail Eating. Henderson explains the philosophy behind this method of cooking with all the parts of an animal, saying ‘it seems common sense and even polite to the animal to use all of it. Rather than being testosterone-fuelled bloodlust, it actually seems to be a gentle approach to meat eating’. Wild Grass owner Jean-Paul Gauci and his cohort Kevin Glerum have rather taken to this kind approach with their new restaurant in Central. 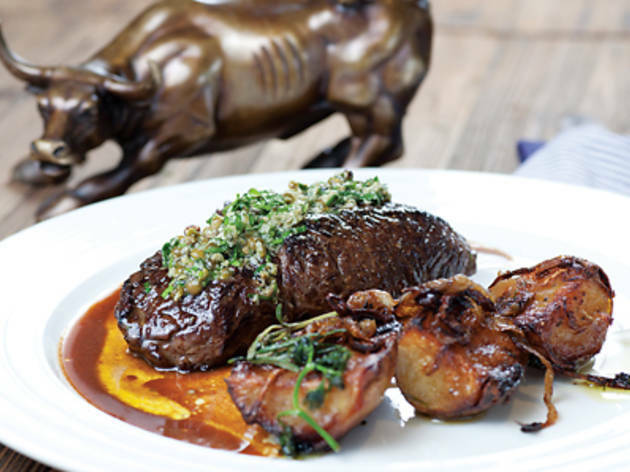 Serving exclusively OBE beef from free-roaming grass-fed Australian Outback cattle, there’s a real emphasis on organic food and no wastage here, particularly when it comes to meat. The restaurant’s inconspicuous location – a spacious spot formerly occupied by European eatery, SoHo SoHo – can make it a hassle to find as it’s an unassuming white venue tucked between glossy complexes and showy cafés with open patios. However, after walking up the Spanish-styled tiled steps, you find yourself in a clean-cut dining arena – a place where even the furniture tries to be mindful of nature. The floors and rustic furnishings are made from an eclectic mix of distressed woods and other reclaimed materials and, with plenty of evolving works of art, a wonderfully French countryside ambience is created. If only the options could be quite as diverse on the Wild Grass menu. Though there are a few dishes to choose from, because most are slow cooked and come with similar side ingredients, we feel we’re trying the same meals over and over again. For starters we opt for the oxtail dumpling, which is swathed in herbs, sour cheese, picked roots, carrots and parsnips ($98) – but it tastes really similar to the spicy tomato soup which contains a goat’s cheese dumpling ($90). The tomato soup’s consistency is denser and its tart acidity makes us feel like we’re slurping on ketchup. Otherwise the whole experience is practically the same due to the ingredients. And the dishes seem to have been made with a heavy hand, with no layers of flavours for us to uncover. Disappointing – but the mains redeem the meal. We want to find out whether there really is a telling difference when biting into meat that has eaten and exercised well. And yes, there is. The ox tongue stewed with capers and green olives ($268) is a rich tomato-based stock topped with a scoop of barley grains. It’s the ultimate comfort dish as the tongue dissolves like cheese in your mouth, leaving a succulent aftertaste. 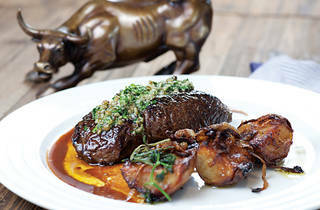 And the slow-grilled rump steak brushed with basil peppercorn relish ($320) is also magnificent. A thick slab arrives on a bed of soggy French fries, its crust perfectly charred brown and its centre scrumptiously pink and soaked in juice. The meat’s leanness and robustness is obvious with each slice of the knife. Also, doused with a just-rich-enough jus, we don’t mind that this meat has run a few times around the (grassy) block at all. If anything, Wild Grass should be a little kinder to its desserts. The dark chocolate Swiss roll ($78) has the appearance of an art project gone wrong. A rather unappetising thick slab of dark chocolate sits on a bed of very green, very gelatinous lime marmalade, creating an eyesore with too sour of a taste. But, by comparison, the stewed apple turnover paired with melting vanilla ice cream ($78) looks and tastes positively delectable. Wild Grass 1/F, 4-8 Arbuthnot Rd, Central, 2812 1826; wildgrass.hk. Mon-Sat midday-11pm & Sunday 11.30am-6.30pm.